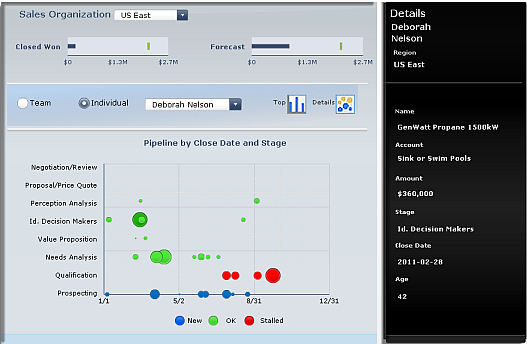 DashConn, an Add-On for SAP Crystal Dashboard Design (previously known as Xcelsius), provides the key connectivity and visualization components to transform your Salesforce CRM reports into easy to comprehend analytical dashboard applications. These rich interactive applications can quench your thirst for sales knowledge, improve sales team effectiveness and create better insight of your leads, prospects and other sales data. DashConn’s capabilities include working with existing Salesforce CRM reports, accessing data directly from Salesforce CRM without requiring a middle-ware solution, and working within SAP Crystal Dashboard Design’s drag and drop environment so that dashboards can be created without developers writing code. This all adds up to the premiere solution to build business dashboards that make evident your key sales performance metrics. Copyright © 2012 IdeaCrop. All Rights Reserved.